Two weeks ago the children were making snowmen. Yesterday they were playing in the sandpit. Ah, the delightful vagaries of a British winter! 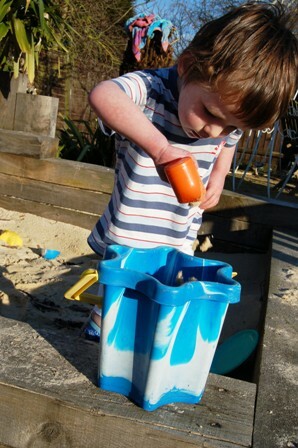 Our sandpit was something of an afterthought in the garden. I had always wanted to create a large sandy space - a reminder of our annual English seaside holiday - but I wasn't sure we'd have the space (or the budget). However, I was nine-months pregnant and in full blown nesting mode, so when our legendary landscaper, Darren, said he thought he could put it together in a day, I decided to go for it. children to play in it together - and plenty of space for ball-runs, monster sandcastles and the obligatory burying of parents. We used oak sleepers for the outside edge - you can buy these from any landscape supplier. As a hardwood, it takes no maintenance and will last for years. It also turns a wonderful shade of silver after a season. The one downside is price - they cost around £25+ each and my design used 12 of them. The sleepers can be laid on bare earth, but putting then on a foundation of graded rubble means that water drains away and the wood deteriorates far slower. The first layer was laid below ground level to give an attractive look to the interior of the sandpit. Darren joined the sleepers together with long brass bolts although they are so heavy, it would be possible to simply rely on their weight and bulk to hold them in place. I stepped the sleepers up towards the corner to give some child-sized seating although the entire outside edge is wide enough to perch on. I also asked Darren to sink some sleepers in vertically to give a backrest and add some interest to the sandpit design. These were bedded into 45cm deep concrete and then bolted into the horizontal sleepers. I was determined to make the sandpit as deep as possible and we eventually dug down about 75cm. We then used tacks to fasten geotextile membrane to the bottom of the interior line of sleepers where it could hang down to cover all the sides. We placed more membrane on the floor of the sandpit to prevent worms mixing the earth and sand. Finally, we were able to fill the area. You can buy playsand in bulk from landscape suppliers. I ordered two large cubic metre bags which was just about perfect to fill our sandpit. I was concerned that I might have created an enormous cat litter tray. Surprisingly though this hasn't been much of an issue. I will probably have a sailcloth cover made up so I can protect the space when it's not in use, but I'm not in a hurry. 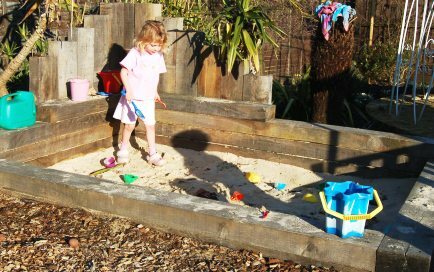 Also, it means the children can access the sandpit whenever they feel like it - even in mid-winter.